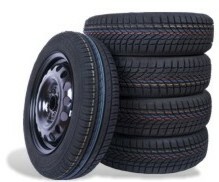 Buying steel wheels with summer tyres as part of a bargain mytyres wheel and tyre package will not only save you the time and hassle of the yearly tyre change - steel wheels represent a durable choice that will withstand rain and curb contact without much difficulty at all. Though they might not have the visual wow factor of their alloy cousins, little tweaks here and there can help ensure a great-looking finish. Cheat with a hubcap or go for a black steel wheel - particularly good on cars of the same shade. Add whitewall tyres and you're ready to go, with a custom-designed wheel that'll stand out from the crowd. Our configurator shows you the steel wheels that are suitable for your vehicle before allowing you to pick from an approved range of tyres. Pictures enable you to visualise the final result.